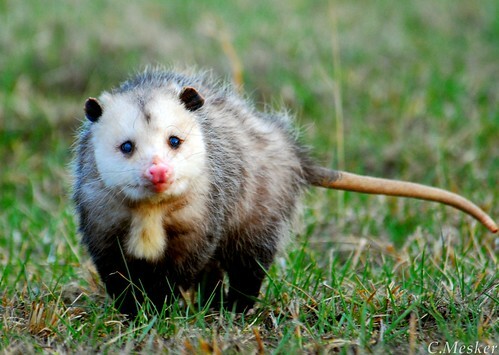 Tis a ‘Possum, I Tell You! Yesterday we were sitting on the back porch having some beverages with friends and enjoying the warm weather when we saw an opossum walking down to the pond to have a drink. I have never seen an opossum during broad daylight (aside from those squished in the road) so it was quite a treat! He eventually made his way around the pond closer to us. Since the ducks have been laying eggs daily (and not bothering to sit on them), Jason got a few and tossed them in his direction. He managed to find one (they don’t see so well) and snatched it up and ate it. Then he made his way around the rest of the pond. As he did this I grabbed my 80 – 400mm wildlife lens and got as close as I could to him. Him, being mostly blind, didn’t see me, but he did hear me and smell me, however he didn’t seem bothered by my presence. I got within about 20 feet of him and whistled at him, causing him to look up and allowing me to get a great shot! Usually the adults I don’t find very appealing, but he was a handsome little devil!